WATERLOO - Dorlis J. Balhorn, 91, of Western Home Communities, Cedar Falls, formerly of Waterloo, died Thursday, Nov. 6, 2014, at Sartori Memorial Hospital, Cedar Falls. She was born Dec. 2, 1922, in Hudson, daughter of Ralph and Edna Smith Witt. 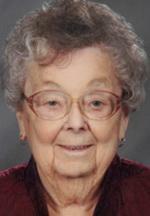 She married Milo “Mike” Balhorn on July 18, 1946, in Waterloo. He died July 19, 2007. Dorlis was past president of the American Legion Auxiliary and the Waterloo Women’s Club, Past Noble Dame of the Waterloo Elklets and was a volunteer with the Covenant Medical Center Auxiliary. Survived by three daughters, Jean Ann Agle of Canton, Texas, Lynda (Gil) Walsh of Huntley, Ill., and Barbara Glessner of Waterloo; seven grandchildren; and 10 great-grandchildren. Preceded in death by a son-in-law, Tom Agle; and a brother, Vincel Witt. Services: 1:30 p.m. Monday at Hagarty-Waychoff-Grarup Funeral Service on West Ridgeway, with burial in Garden of Memories Cemetery. Visitation will be for an hour before services on Monday. Memorials may be directed to Cedar Valley Hospice or Sartori Memorial Hospital Foundation.